A weekend in London on previous visits might have involved some museums, maybe a show and definitely shopping. This recent Bank Holiday in London was far more chilled. We had taken Rory and his girlfriend with us and had deliberately kept our plans flexible. It ended up being one of our most enjoyable visits to the capital, though I suspect the fabulous weather may well have had a bearing on that. 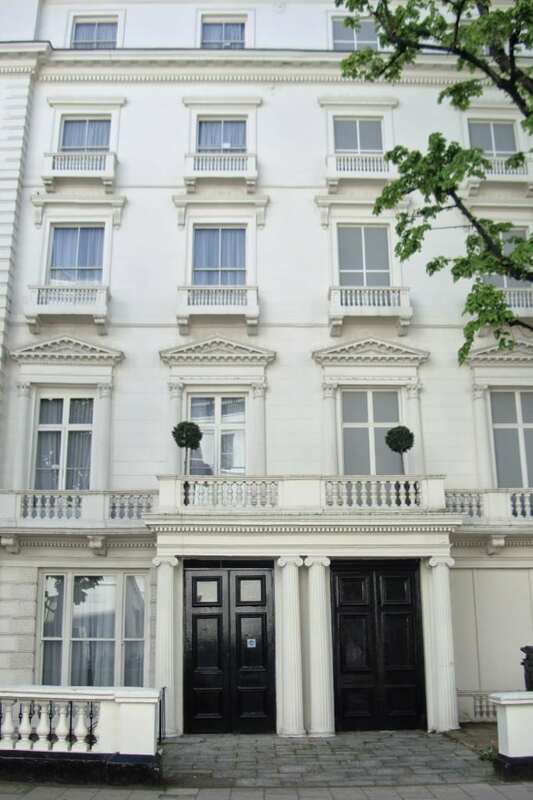 Our Go Native apartment was ideally situated two minutes walk from the entrance to both Kensington Gardens and Hyde Park. Arriving on a Saturday afternoon, we checked in and within minutes of dumping our bags, headed straight out into the sunshine to explore. The Royal Parks really do feel like another world as you leave the busy streets behind. We walked past the beautiful Italian Gardens, the Peter Pan Statue and The Arch then enjoyed a good bit of people-watching as we dipped our feet in the running water of the Diana Memorial Fountain. There was such a happy atmosphere in the park, you couldn’t fail to feel relaxed and cheered by the sight of so many families, couples and groups of friends making the most of the weather. Unexpectedly coming across several mews in the vicinity, this became a new sport for the family. The streets around Bayswater have several mews and are well worth a peek. 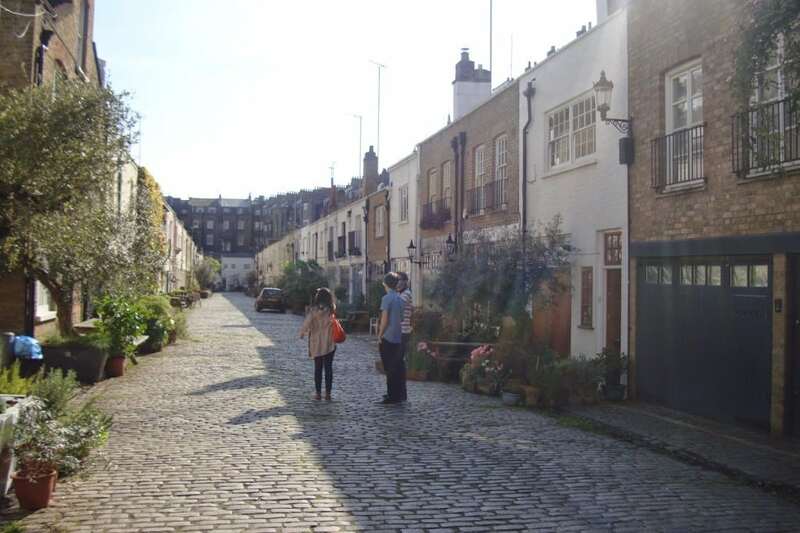 Although the traditional stables are no longer a feature of these gorgeous little streets, our favourite in the area, Bathurst Mews, does have an actual riding school at one end so we could envisage what they would have looked like in previous centuries. The pretty doors, cobbled streets, the abundance of flowers in pots outside each home and the tranquil atmosphere: was this really central London? Bathurst Mews in the hazy evening sunshine. If you watched the recent series of Sherlock Holmes, you might remember the final episode when Holmes takes Mary Watson to a street where the houses are fake. 23 and 24 Leinster Gardens look, at first glance, like all the others in the terrace – until you take a closer look. In the photo below you can see a normal house on the left and Number 23 on the right. Check out the windows and you will see that they are opaque. 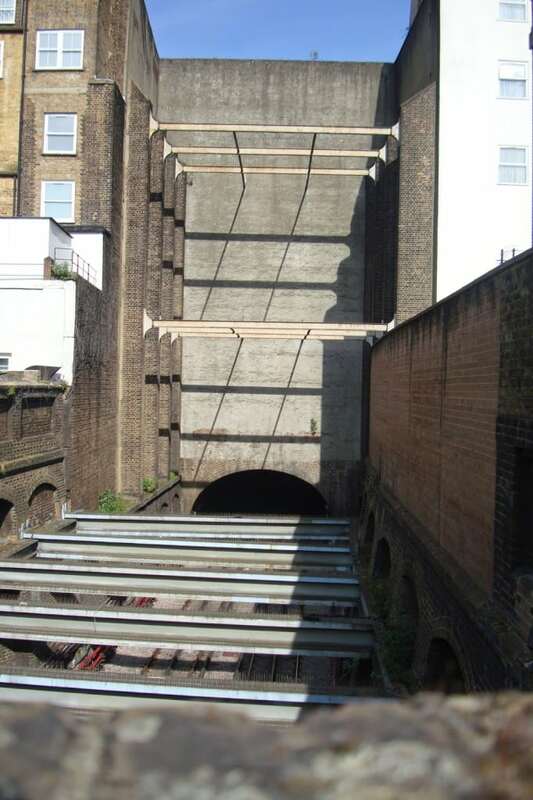 The facade was created when an extension to the Metropolitan Line cut through the terrace in 1868. Such a typically British solution to the problem: don’t just knock the houses down – put up a fake front and let’s just pretend they are still there. Underground trains still trundle below the streets and the best way to see this is to walk round to the back of the houses to Porchester Terrace. If you place your camera on the high wall you can take a snap and then look at the result to actually see the tracks below. View of the back of the fake facade – seen from Porchester Terrace. How have I never visited this part of London before? Taking a path between Paddington Station and St Mary’s Hospital took us along the towpath to the charming area of Little Venice. 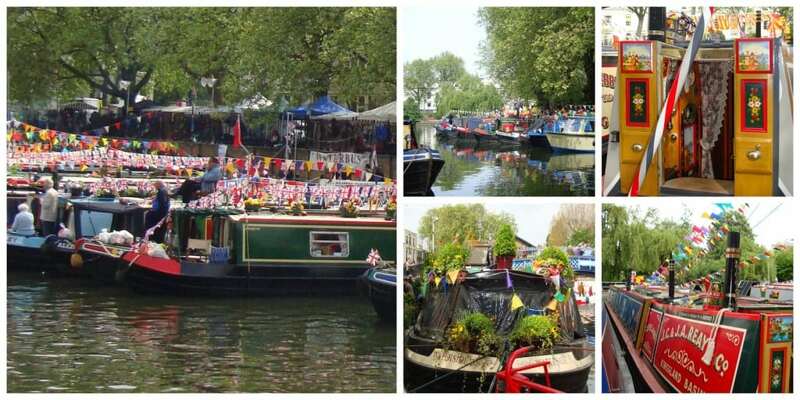 We were lucky to be visiting during the annual Canalway Cavalcade when over 100 boats from around the country had travelled to the junction of the Grand Union and Regent’s Canals to be part of this wonderful little festival. Stalls, bars, entertainment and the most beautifully decorated boats made this a typically British affair. Ok, so we did do a little bit of shopping but Oxford Street was so close to where we were staying it would have been a shame not to have had a little browse. However, the weather was too nice to be inside so we picked up some lunch then stumbled across a secret place where we joined others soaking up the sun: not so secret then. Brown Hart Gardens is a public square to be found, strangely enough, on top of an electricity substation just off Duke Street. When the substation was built in 1902 it required the removal of the residents communal garden. The Duke of Westminster insisted a paved Italian garden be created on the roof. It remained a public garden until 1980 and was then closed by the London Electricity Board. Eventually in 2013 it reopened with the addition of a glass building housing a cafe, Benugo’s. It was so gorgeous and peaceful up on the roof with the trees, plants and water features. Who would have thought our weekend away in London would have had the same ambience as a weekend in the English countryside: public gardens, cobbled streets, canals and secret roof terraces. Perfect. We stayed right across from Hype Park when we were in London. Loved it! The kids were little and had so much fun on all the play equipment…especially the pirate ship. Love little Venice. I used to have a friend who lived there; her mother was very Ab Fab and would throw dinner parties for her daughter's mates and sit at the head of the table swigging Bolly smoking like a chimney and lecturing us all about how square we all were for going home early because we had work the next day. She was fab and probably still swilling about in a lake of booze. Now if only we had found your friend's mother – that would have made the weekend! What a delightful visit, and I'm sure the glorious weather was a big part of your enjoyment. Not much fun taking a picnic to eat in the rain! I've never visited Little Venice either. Must go sometime. It was Dougie's idea to hunt out Little Venice: I had no idea it was so close. It was only when I had a quick google we discovered the festival was on. Love those fake houses. Bet the people next door can't believe how noisy their neighbours are! I just can't imagine what it must be like living next door – looking out of the back window must be a treat too. I really need to come with you on a trip to London, you seem to see so much more than I ever manage! The fake house is fascinating and the mews remind me of a scene in Love Actually! It really was a super visit, Jay – all these secret places seemed to just pop up. We could have seen a lot more things in the vicinity if we'd stayed longer. I'll need to watch that film again and see if I can spot that scene. What a wonderful visit….and thanks for the tip about the elevated garden…going on my list! It was Dougie who suggested we go up the set of steps: I thought it was private but it wasn't. Ideal for a warm day. Some lovely parts of West London… I think West London holds some very pretty spots – I love all the Mews, so tucked away and quiet, and I used to go to a college in Little Venice – very, very pretty! Oh how wonderful to have gone to college in Little Venice. Next time I'd like to take a trip up to Camden Lock from there. I'll have to go back now that you've told me about these lovely things to see! We used our apartment there more as a base to see London than exploring what was on the doorstep and now I wish we'd stayed longer to check out the area. I had no idea all these places were so close and so interesting. I used to work in Oxford Street when I left University – very rarely walked around properly to check things out! Really love this post Trish. It's almost like a guide to some of the hidden beauties of London. I think Jess would love to see Leinster Gardens too! 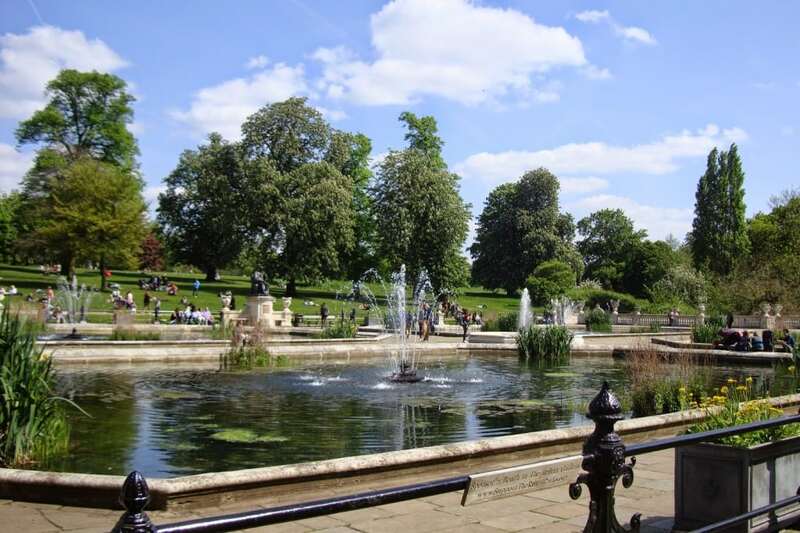 I have my husband to thank for finding these treasures – he had heard of Little Venice, we had both enjoyed the Sherlock Holmes episode about the Leinster Gardens but I hadn't realised they were round the corner until Dougie told me. He even found the terrace for lunch! Call myself a travel blogger! Every time we go to London we find something exciting. I can't believe I lived there for three years and didn't come across half the things I spot when I am there on holiday. You must have lived in such a pretty street if it was anything like some of the places we saw that weekend. I am always astonished at the many green spaces – you can appreciate why tourists flock here. It just seems incredulous that the trains would run so close – or that you would buy a house next to it! Yes, you must go. You can approach it from Paddington station or Warwick Avenue tube station. I love how you have gotten around and found some hidden gems – I don't get to London much at all but next time I'll try and squeeze in Little Venice! We were so lucky to visit Little Venice when it was so full of gorgeous boats. I hope it's still as pretty at other times – I'm sure it must be. Join the queue, Susanna – and take a boat trip from there to Camden Market – I think your girls would love it. Love the fake house, how interesting! The mews are beautiful arent they! Am long overdue a lazy weekend in London, but visits there always seem to be with a purpose in mind and not enough time to explore! I found the fake houses just mind-boggling. They really made me smile as they were just so bizarre. This weekend was perfect for us – no schedule, no plans, just time. I was lucky enough to be a student in London and as I was always skint I walked everywhere and so discovered some wonderful little places that were off the tourist route. Being more recent Brown Hart Gardens is a new one on me. I must try to remember it the next time I'm in town. There was a book I found when a student by a guy called Andrew Duncan called "Secret London" which tells you all about lots of lovely little quirky places in London. He also wrote several walking guides to the city which are lovely if you want to go and do a walk and discover part of the city without paying to go on one of the guided ones. Sounds like an amazing weekend – London in the sun is awesome. We do have some cracking parks too don't we? Little Venice looks like a riot of sound and colour. I've never seen it before since I don't get to London much at all but if I were to go I would have to seek it out. There's something so charming about all of those barges. Great post, the bit about the fake houses really interested me! You really saw the best of Hyde Park too!